In 1936, the US Mint struck the Long Island Tercentenary Half Dollar Classic Commemorative Coin in celebration of the 300th anniversary of the Dutch founding the first settlement on Long Island. On April 13, 1936, the second session of the 74th Congress approved an act which became Public Law 74-517 that authorized "the coinage of 50-cent pieces in commemoration of the three-hundredth anniversary of the founding of the first settlement on Long Island, New York." The law began, "That in commemoration of the three-hundredth anniversary of the founding of the first settlement on Long Island, New York, there shall be coined at a mint of the United States to be designated by the Director of the Mint not to exceed one hundred thousand silver 50-cent pieces of standard size, weight, and composition, and of a special appropriate single design to be fixed by the Director of the Mint, with the approval of the Secretary of the Treasury, but the United States shall not be subject to the expense of making the necessary dies and other preparations for this coinage. "SEC. 2. The coins herein authorized shall bear the date 1936, irrespective of the year in which they are minted or issued, shall be legal tender in any payment to the amount of their face value, and shall be issued only upon the request of the chairman or secretary of the Long Island Tercentenary Committee upon payment by him of the par value of such coins, but not less than five thousand such coins shall be issued to him at any one time and no such coins shall be issued after the expiration of one year after the date of enactment of this Act. Such coins may be disposed of at par or at a premium by such committee and the net proceeds shall be used by it in defraying the expenses incidental and appropriate to the commemoration of such event." The coin's estimated value ranges from $65 (low grade - XF) to $640 (high grade - MS-66). Extraordinary characteristics on the Long Island Tercentenary Half Dollar can command a price outside the estimated value range. The obverse or front of the coin features head images representing an Indian and an early European settler. The coinage inscriptions say, Liberty and E Pluribus Unum. 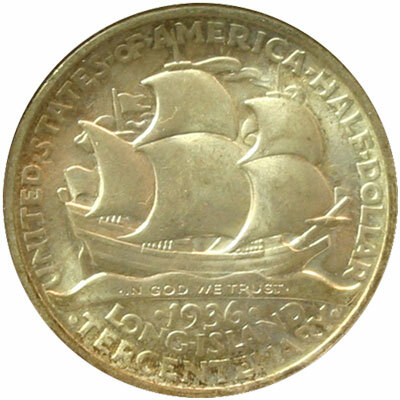 The reverse or back of the coin shows a ship in full sail. 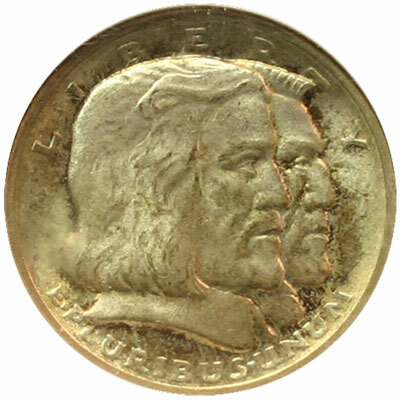 The coinage inscriptions read United States of America, In God We Trust, and 1936 Long Island Tercentenary. The stated mintage was "not to exceed one hundred thousand silver 50-cent pieces" and "coined at a mint." Records show the Philadelphia Mint produced 81,826 of the Long Island Tercentenary half dollar coins. The coinage artist for the Long Island Tercentenary half dollar, Howard K. Weinman, had a notable coinage artist for a father. His father, Adolph A. Weinman, produced the designs for the Walking Liberty half dollar and the Winged Liberty (Mercury) dime. Today, the Walking Liberty obverse design can be seen on the American Eagle Silver coins. Though not yet available, in Public Law 111-303 dated December 14, 2010, Congress approved the minting of palladium bullion coins with the obverse to have "a high-relief likeness of the ‘Winged Liberty’ design used on the obverse of the so-called ‘Mercury dime'." Dated in April 1936, the New York Times printed a press release from the Albany, New York Governor's office. "Governor Lehman sent invitations today to twelve Governors and representatives of five foreign nations to attend a dinner in Brooklyn on June 6, which will mark the close of the Long Island tercentenary celebration." Governor Lehman resigned from Lehman Brothers, investment banking, to serve in politics. During the tercentenary celebratory year, he was in his second of four terms as New York's Governor. The Garretson's family history told of the Prins Maurits, a Dutch ship, which shipwrecked near the Long Island settlement in March 1657. Three ships on their way from Holland to Delaware became separated. Bad weather pushed the Prins Maurits past their destination of New Castle to run aground near Long Island. With help from the Indians, the crew and passengers made it to shore and sent a message to the Dutch colony at Long Island for assistance. The travelers finally achieved their destination in April. Visit our GACS Numismatic Shoppe Long Island Tercentenary for a variety of useful items decorated with images of the classic commemorative silver half dollar coin.